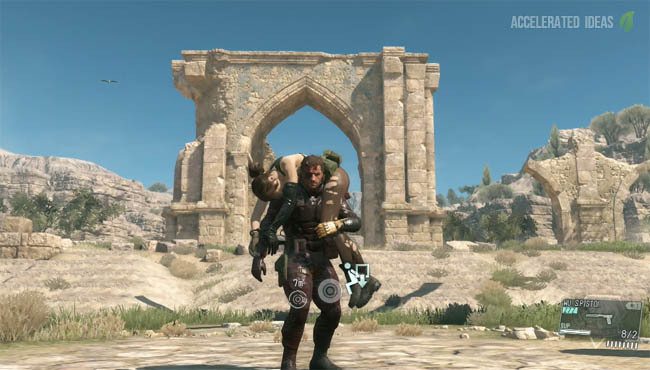 Another of the annoying quirks in The Phantom Pain has made its appearance for the Legendary Gunsmith missions. Without the right knowledge, Side Op 108 (or 109) won't appear in your mission list and you'll be unable to complete and unlock the Legendary Gunsmith. When I first started Side Op 107 I was quite far into the game, having already unlocked Chapter 2. It seems that this only made things about a million times worse for me. 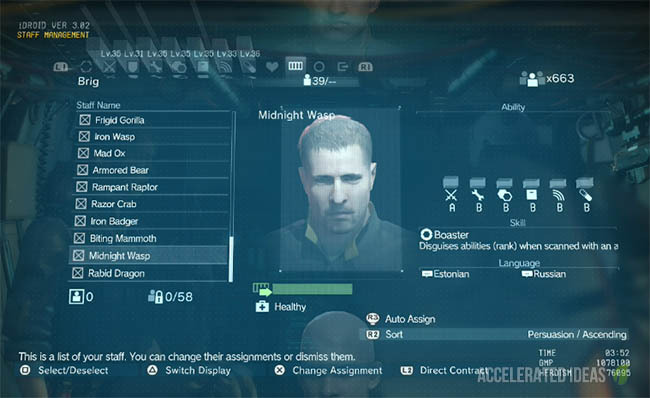 It turns out that the game has some odd requirements before Side Ops are unlocked and appear on the Side Ops list. It's not just about the order of unlocks either. It's more complicated than that really because Side Ops share a space on the map and even future Side Ops can interfere. 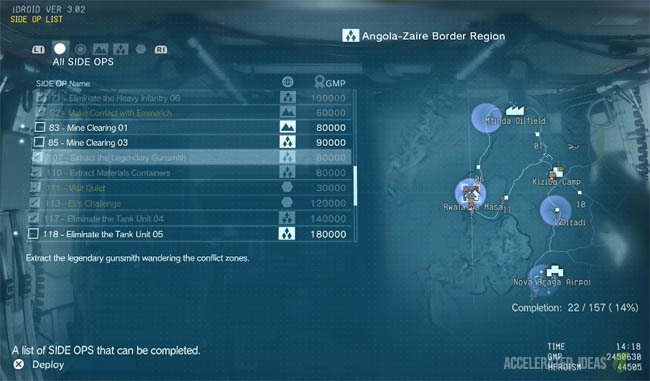 Yeah you heard right, Side Ops you don't even know about can conflict with the Legendary Gunsmith path. I had a particular Blueprint Side Op (which wasn't unlocked yet) that interfered. Having just completed Side Op 107 (the first for the Gunsmith path) I was expecting to get some kind of prompt for Side Op 108; even returning to the helicopter (ACC) made no difference and the Side Ops list was unchanged. I guess this is the same experience for those of you reading this post right now? Probably like you, I had a fair number of missions to get through on the side, including many Blueprints, Tank Unit, Mines and even a couple of important Side Ops for Chapter 2. Maybe it were these Side Ops that were interfering with 108 and I needed to trigger that Side Op much like the interpreter Side Op is triggered by listening to enemies in the field. I went about completing Side Ops all over the place, some Tank Units, Blueprints, Prisoners...nothing worked. It turns out that some Side Ops will prevent others from appearing on the list. Not because they are in some kind of order but because they share the same destination. This is the solution you're looking for. As I completed 143 and 10, the 108 Side Op appeared in the list after returning to the chopper. There was even a reassuring audio prompt from Mother Base to let me know that we were still searching for the Legendary Gunsmith. Once again, a similar event took place after completing 144 which successfully unlocked Side Op 109 - allowing me to complete the final part of the Gunsmith journey. Note: if Side Op 10 doesn't appear in your list, make sure you complete Side Op 6 (Stun-Arm). I had to do this. 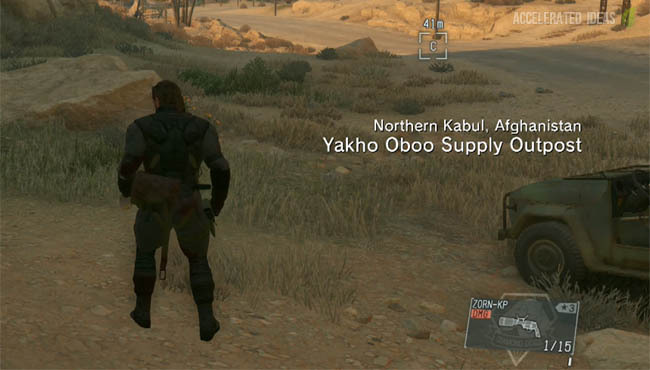 There we have it, another slight annoyance with MGS 5. Certainly not a biggie, and the games so awesome I can easily forgive these infrequent disturbances.